Since the beginning of their exclusive partnership in January 2018, experts from the Arthroscopy Association of North America (AANA) and VirtaMed have worked together to develop the first of several enhancements to the ArthroS™ simulator for knee, shoulder, hip, and FAST. 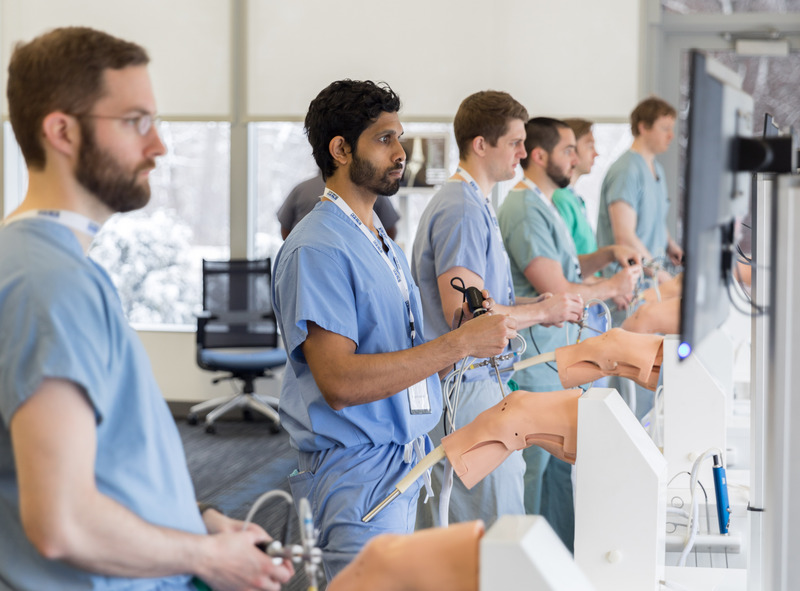 The first set of enhancements, already in use at the Orthopaedic Learning Center’s (OLC) innovative teaching labs located just outside of Chicago, focuses on the knee and includes new integrated guidelines informed by a group of AANA surgical experts. Additional AANA-informed enhancements for other modules will be released in the coming year. VirtaMed’s ArthroS™ simulator is widely acknowledged as the most realistic virtual reality simulator for arthroscopy training, and the team of developers behind the simulator are excited to continue improving the teaching components available. The close collaboration between AANA experts and VirtaMed had resulted in additional training opportunities, and residents and fellows training on the ArthroS™ Knee simulator can now benefit from new guided diagnostic tours and additional diagnostic cases for multiple, complex, or rare pathologies. AANA’s Education Committee Chair, Kevin F. Bonner, M.D., noted that “We have seen great improvement in all sub-specialty groups and from the educational perspective we look forward to implementing simulators in many of our courses as a means of assessment.” The knee enhancements are the first of several to be released, with updates to VirtaMed’s Fundamentals of Arthroscopic Surgery Training (FAST) module to be released next month, with updates to the ArthroS™ Shoulder to follow shortly thereafter. These enhancements are already being used in training courses at the OLC. According to Joseph Tauro, M.D., Chair of AANA’s Learning Center Committee, “Our AANA/VirtaMed teams have made great strides this year in VR programs for diagnostic arthroscopy of the knee, shoulder and hip. Our course participants love the simulator and we are finding that it is a very useful teaching tool. We are looking forward to great progress and more operative simulations in 2019." VirtaMed, the Swiss-based company, with offices in Florida, Los Angeles, and New York, has a development team of specialized engineers working to bring the latest simulation technology to the fields of orthopedics, gynecology and urology. “VirtaMed is proud to be the world leader in arthroscopy simulation, working to integrate simulation into the curriculum of leading institutions such as HSS, Cedars-Sinai, Brown, and Cleveland Clinic,” states Rick Hoedt, President & General Manager, VirtaMed Inc.